Creation - On Earth Day I pondered all the things I am grateful for like the amazing and incredibly creative God we have to call our Father. Pondering the heavens and the earth (dirt) is a seemingly endless mind-blowing event. God spoke all of it into existence with words. Our words can do so much good or so much bad. The Bible says, "Death and life are in the power of the tongue." What we say changes our minds, hearts, environment and our very lives. It's never too late to be grateful. 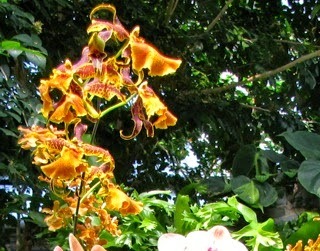 Any day is a great day to meditate on the wonders of our God ... but consider this article which points out 50 Crazy-Wonderful Things About Earth that we could meditate on any time as we sit in a garden or woodland setting or by the beach or where ever your "secret place" is where you meet with our Lord. Here's a few of the 50: Some butterflies drink turtle tears, earthworms have five hearts, rabbits can see behind them without moving their heads, a tablespoon of soil contains more than 1 billion living organisms, earthquakes can instantly create gold in the earth’s crust, and I love this one: Half of the world’s land is still wilderness! If you want to know about Creation renewing itself, read this article I wrote: Doom and Gloom or Peace and Provision. Do you see the world becoming more toxic, or do you see God's promise to daily load us with benefits? ("Blessed be the Lord, who daily loadeth us with benefits, even the God of our salvation. Selah." - Ps. 68:19). God's Provision - The GMO issue rages. Some research says "nature" got there first, before GMO ever entered into the minds of the inventors. You never know who's paying for the research ... but that's the case of everything in the media. It's time to regain our sense of intuition and "knowing" inside. Gut feelings or hearing the Holy Spirit is my way of putting it, not what makes sense to our brains or what's on the news. All facts should be lined up beside the Word to see if it's actually Truth. Consider Mark 16:17-18, "And these signs will accompany those who believe: In my name they will drive out demons; they will speak in new tongues; they will pick up snakes with their hands; and when they drink deadly poison, it will not hurt them at all; they will place their hands on sick people, and they will get well." What a powerful verse. Obviously most of us called "those who believe" have lost touch with these words that Jesus' left with His followers, but it does include us when He says, "those who believe." It's easy to say this was just for the apostles but read Mark 16:15-16 to be assured it was to everybody that believes. Trees - Mr. Bud is shining in all God's glory this year. He's been the highlight of our Springtime. What a victorious time of rejoicing! He's such a symbol of God's love and support for us in all trials and tribulations. He will bring us through if we trust and rest in Him. If you've not been following Mr. Bud's story on our property, here's the link to: Mr. Bud Survives The Crimes. Tidbits - McDonald's announced on April 22 that it's closing 700 poor performing restaurants around the world – half of those in the United States, China and Japan – as this fast food giant tries to "rebound from financial losses sustained around the globe." I hope that means people are eating less junk food and not just changing restaurants. The USDA is now encouraging people to eat certain foods past their expiration dates. They say that many products may have a sell-by date that is now past but they could be good for another 12-18 months. 21% of available food in America goes uneaten. They've come out with an app for smartphones to help you figure out different products' shelf lives. Read the whole story. Chipotle Goes GMO-Free - Chipotle just raised the bar on fast food—again! The Mexican grill restaurant, known for offering safer, more humane ingredients, has announced its banning GMOs from their menu. This is the first national chain to do so. Others will need to get onboard. The proof is in the numbers: While Chipotle experienced 28% growth in sales, McDonalds suffered a 2% decrease. The Patent-leather Beetle is a large beetle which can grow to just over an inch-and-a-half long. 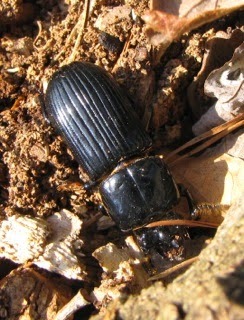 They are shiny black and have many long grooves on their outer wings. They have a small horn between their eyes, and clubbed antenna. Birds - Our Ruby-throated Hummingbirds returned from their winter sojourn on April 23. The males depart about 10 days before the first females begin the journey. Hummingbirds travel alone and they leave their various areas of winter refuge at different times. The migration is spread over a 3-month period, which prevents a major weather event from eliminating the entire species. Ruby-throats begin moving north as early as January, and by the end of February they're at the northern coast of Yucatan, gorging on insects and spiders to add a thick layer of fat to prepare for the flight to the U.S. Before departing, they have nearly doubled their weight from about 3.25 gms to over 6 gms. When it reaches the U.S. Gulf coast, it may weigh only 2.5 grams. Some will skirt the Gulf of Mexico and follow the Texas coast north, while most cross the Gulf, typically leaving at dusk for a nonstop flight of up to 500 miles, which takes 18-22 hours depending on weather. Our Catbirds have also returned. A pair nested a foot from one of the breakfast area windows last year and I am hoping it will remodel it and do it again. The male has been calling. They are mimics like the Mockingbird but with a softer tone. Sounds really sweet. View Video of Catbird Singing. Blue Jays are some of the biggest, brassiest and most colorful backyard songbirds in North America. They’re part of the crow family, so they’re very smart, too. Some people find them too loud and bold, but many more welcome any sighting of this beautiful bird, like me. Most of the Eastern half of the U.S. sees blue jays. 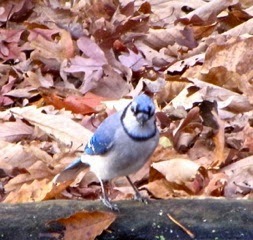 Our Blue Jays have always been very polite and never a nuisance. We live rural though, so the abundance of the food supply with more land to forage, and the abundance of our feeders, probably makes them less stressed and more agreeable. They are 11-12 inches long and quite the sight with all the beautiful markings. I think their coloring and artistic pattern is quite unique. You certainly can't confuse this bird with anything else in the area. I got this shot of one at the pond getting a drink, but at the moment I released the shutter he was face-to-face with the camera. Certainly gives him a unique look. They enjoy acorns and peanuts if you want to attract them. We don't do peanuts, but we have tons of oak trees that supply a super abundance of acorns, which we are happy to have eaten up so we don't have to pull out crowded oak trees. They are year-round residents here at Bluebird Cove Habitat. In The Woods - Whenever we have a tree that has fallen, we make garden stools out of them. They are ideal for places to sit and ponder. The woodpeckers love to check out the outside bark for bugs. You can also use them to put a birdbath on top or a butterfly puddle. Besides all of that, lizards love to crawl in and out of them as they decompose and there's a whole world of tiny critters making use of them. They break down from the middle outward, so when there's a hole in the center, fill it with a bit of straw, leaves or pine needles and dirt - the straw keeps the dirt from falling through. Then add some annuals to make your yard really shine with color. It feels so good to allow a tree to go to full decomposition. It gives it an alternate life after it no longer stands tall in the forest. When you consider it takes generations for some trees to reach maturity, the loss of a majestic tree is a very sad moment in my life. Even when a neighbor has a tree cut down for whatever reason, we have asked if we can take the pieces if they're not going to be used for something else. There's a variety of outdoor things that make use of a tree trunk which allows you to enjoy the tree even if you no longer rest in the shade of its canopy. These will last for various periods of time depending on the kind of wood/tree the trunk comes from. Woody plants take a long time to break down. 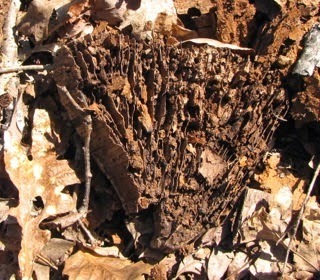 Fungi is mostly the first agent acting on decay and there are many species that grow in dead wood. The growth of the fungus within the wood helps other things like bacteria and beetle larvae to gain access. As the wood becomes more penetrated and open, through, for example, the galleries produced by beetle larvae, it becomes wetter and this facilitates the next phase of decomposition. 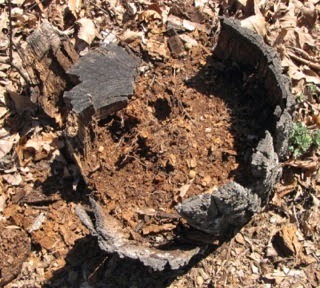 Invertebrates that feed on the decaying wood, and predators and parasites, such as robber flies and ichneumon wasps, will also arrive, to feed on beetles and other invertebrates. These are good bugs that help to control your bad bug populations. Next time you have to remove a tree or its time has come to hit the ground, consider alternative options instead of just having it chopped up into wood chips .... unless you're going to use those wood chips in YOUR garden. Travel - Virginia - We did an overnight trip to the Norfolk/Virginia Beach area of Virginia which is about 3 hours from us. 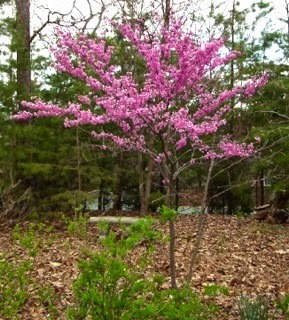 The highlight was to be the Norfolk Botanical Gardens which I mentioned in the last newsletter. But I've had this dream to lay on the beach again. In 1976 I was diagnosed with vitiligo and banned from sun activities. I was a water girl ... my Daddy used to say I was part fish. As a teenager I lived at the local nearby pool all day in the summer with trips to "the shore" in Maryland when I could drive. So on a bit chilly of a day, we visited First Landing State Park in Virginia Beach. 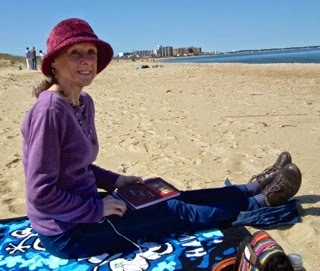 I spent a couple hours on Easter morning on a beach towel with my face covered with my hat. I had my Walkman to do some meditation and focus on the death, burial and resurrection of our Lord. I don't know what word would express those minutes. It was surreal and certainly boosted my faith and hope in the area of healing. We went to the Visitor Center first and the lady there "just happened" to mention that the Camp Store had bicycle rentals for $5/hour. I've not ridden a bike for 40 years. I knew it was a crazy idea with my heart, but I don't listen well to the "things below" (on this earth) as I do on the "things that are above" (in Christ). Like they say, "it comes back you to in a few moments." Actually took about 5 minutes to feel steady on it. I stayed in the parking lot on the asphalt since the trails were all gravel and sand which I knew, disappointingly, would be quite impossible. The ride around the Camp Store was exhilarating for sure, but my heart and muscles were screaming at me. 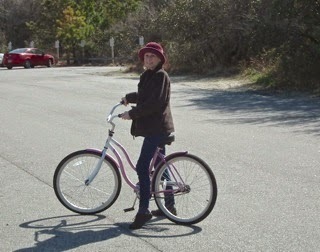 So we took the bikes back in 20 minutes, but I was totally thrilled that I chose to do it. View First Landing State Park Photos. Randal had a grand time also. He's such a great supporter of my "impromptu and stupid moments" as some of my friends call them. I may not have a full day of such things right now ... but if I don't keep myself in the loop of life, there's no life worth living within me. So I enjoy "impromptu and stupid" now and then even when it takes a week to recover. What's the worst case scenario the doctor laid out three years ago? That I'd be dead by now without the surgery and a pile of drugs. Well, that hasn't happened, and even if it does, what's the problem for me? I'll be dancing with Jesus in Heaven. I don't like the thought of leaving my wonderful husband and marvelous son behind ... but it's going to happen at sometime anyway. But before that day in the future, I'll be totally healed. 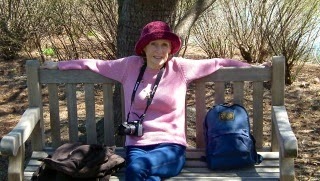 We also visited York River State Park in Williamsburg on the way back home Easter Day. I slept from First Landing to York River but had enough energy to walk about the visitor center and the level areas around the parking lot. I would've LOVED to be able to do a nature trail, but my body does tell me when "enough is enough." 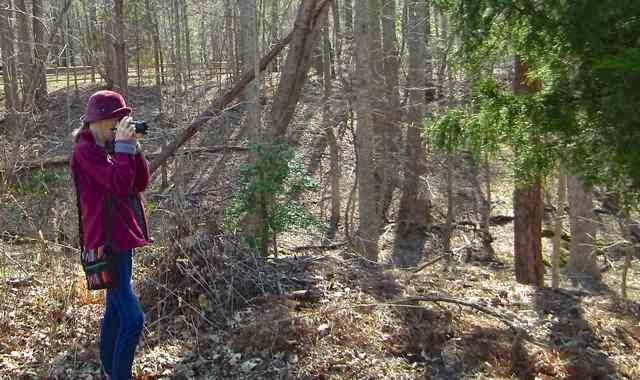 View York River State Park Photos. I still have a bit of sensibility. Randal has carried me off of nature trails back to the car a couple years ago and that was a "field trip" in itself laughing all the way, but it even takes energy to hang on to him for that and I didn't have it on this impromptu and busy day ... actually I didn't have energy for the week, but after that I began to plan some to visit some natural areas during our next overnight trip to Woodbridge, Virginia, where we were scheduled to attend a day of a 3-day Andrew Wommack seminar (See Meeting Schedule). More on that in the next newsletter. Spiritual - Thanks to Lynn Alford for sending me an article that had this segment below on our self-worth. I think this topic is a critical issue within the church. I heard some startling statistics about the percentage of Christians who struggle with depression. If we knew who we really were, depression would not be an issue. And by knowing I don't mean that you know a verse that you memorized on this topic ... I mean know in your heart, which is where Jesus said we had to believe for our faith to work. Don't just read these words ... ponder the message for days when you lie down to sleep and chew on it when you get up. Begin to look at yourself in the mirror every day and speak to yourself as God would about you. Look up Scriptures that tell you how much worth and value God assigns to you. You need to believe what God says about you ... not what the world and our scarred souls try to cram in. Jesus said, “I am not praying for these alone, but also for the future believers who will come to Me because of the testimony of these . . . so that the world will know You sent Me and will understand that You love them as much as You love Me.” (John 17:20,23) Can you believe you are loved by God the Father as much as He loves Jesus? That's something to meditate on for a long time. What am I worth? Jesus wouldn’t flash a financial statement to answer this question about Himself, so neither should I. The value of anything (to a purchaser) is determined by what he’s willing to pay for it. The Living God bought me. He could’ve bid a used dumpster for me and bid North America for Billy Graham if He’d wished because He can do what He wants. After all, Billy lives in a tall, handsome earthsuit and reaches millions for Jesus, but this is the wrong perception. God offered the only Boy He had to purchase me. He gave the Apple of His eye, His only Namesake! That’s Who God spent to purchase me. Oh, I tell you, I have great value. To God, I’m worth Jesus! Picture a balance scale with Jesus on one end and me on the other. My worth and Jesus’ worth are equal in God’s mind. There’s a worth that can never erode! I may lose my job through health or economic reversals. My retirement program may collapse. I may lose my family, house, car, prestige, or be disgraced. Will that lower my true value? Never! My worth is set in Eternal Concrete. I enjoyed every bit of this. Thank you. How sweet of you to say so, Sandra. Thank you! I see you're from Oklahoma. Our son lives in Oklahoma City.